Recently, Xerox has made significant improvements to their A4 (desktop) colour and monochrome printers and MFPs, and are being recognized for it. Buyer’s Lab, the industry standard in unbiased, thorough testing and rating, has awarded Xerox its 2018 A4 Monochrome/MFP Line of the Year title. With several individual awards in specific categories (“Picks of the Year”) to go along with the Line of the Year honours, Xerox has a wide variety of printers and MFPs, in sharp monochrome or vivid colour, to suit any office environment. Xerox Genuine (OEM) toner and Revolution compatible toner available for most models. The VersaLink C505 colour MFP (and its big brother the C605) are meant to replace full size copier/MFDs when you need a device to handle the print volume, but don’t need to print on 11×17/Tabloid size paper. Configurable with G3 fax, extra paper trays and storage cabinet, and staple finishing (C605 only). Comes standard with a 100-sheet Single Pass document feeder. Download the brochures for the C505 and C605 for a full list of features, options and accessories. The baby of the VersaLink MFP family, the C405 still packs a punch, with a standard 50-sheet Single Pass document feeder, standard fax, and a long list of accessories like extra paper trays and wi-fi connectivity. Xerox OEM toner and Revolution compatible toner available for this model. Download the brochure for the C405 for a full list of features and accessories. 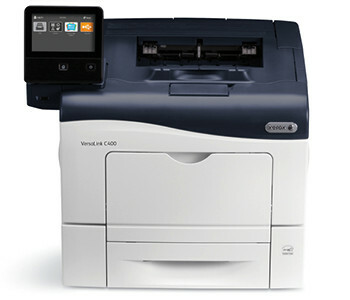 The C400 is the printer version of the VersaLink C405. This compact printer produces vivid colour prints, and can be configured with a duplex unit, extra paper trays, and wi-fi connectivity. Xerox OEM and Revolution compatible toner available for this model. Download the VL C400 Brochure for more details on features and options. This quick, brilliant colour printer can be configured with an optional duplex unit for double-sided printing, extra paper trays, and wi-fi connectivity. Comes standard with a 50-sheet bypass tray for printing on a wide range of paper stocks up to 220 gsm (80lb Cover). Download the Phaser 6510 Brochure for a full list of features and options. This compact little printer is a perfect companion on any busy desktop where quality is required, but space is in short supply. The 150-sheet paper tray can print on paper stocks up to 163 gsm (60lb Cover), and the built in wi-fi connectivity means you only have to worry about a power supply. Xerox OEM and Revolution compatible toner available for this model. Download the Phaser 6022 Brochure for a full list of features and specs. 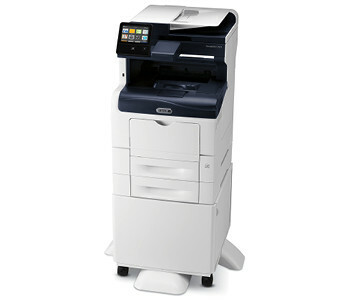 This versatile MFP is built for heavy duty in hectic offices. Can replace full size copiers/MFD’s in environments where printing on 11×17/Tabloid paper is not required. Comes standard with G3 fax, 100-sheet Single Pass document feeder, and is customizable with multiple extra paper trays, 50-sheet staple finisher, and wi-fi connectivity. Download the brochure for the B605 for a full list of features and accessories. The monochrome twin of the VersaLink C405, the B405 also comes built with a standard 60-sheet Single Pass document feeder, standard G3 fax, and a long list of accessories like extra paper trays and wi-fi connectivity. The full colour, intuitive touch screen offers the same features and customization as the larger VersaLink devices. Great for small workgroups with monthly print volume of 500-2000. Download the brochure for the for the B405 a full list of features and accessories. 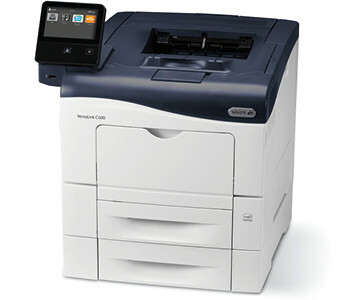 The WorkCentre 3655i may be the same speed as the VersaLink B405, but it is built for heavier volume. The 3655i fits nicely between the B405 and the B605, and is best suited for workgroups of 4-6 people, printing 1000-6000 prints per month. Comes with built in 60-sheet Single Pass document feeder, and is customizable with extra paper trays, G3 fax, and wi-fi connectivity. Download the WorkCentre 3655i brochure for a full list of features and accessories. 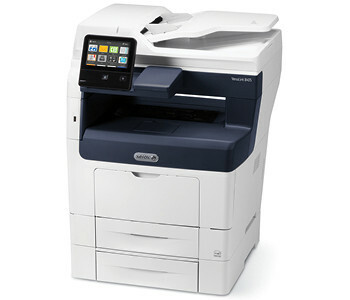 This award winning printer from Xerox’s new VersaLink lineup is built for speed and performance. Comes built in with a large 550-sheet paper tray and a 150-sheet bypass tray that can print on paper stocks up to 220 gsm (80lb Cover). The optional wi-fi connectivity allows placement anywhere in your office you have a power source. Can be configured with up to 3 more 550-sheet paper trays. Download the VL B400 Brochure for a full list of features and options. Compact and fast printer for a busy desk or a small group of people. Comes with a 250-sheet Letter/Legal paper tray and a 50-sheet bypass tray, but can be configured with an extra 550-sheet Letter/Legal tray. Comes with built in wi-fi connectivity. Download the Phaser 3330 Brochure for a full list of features and options. 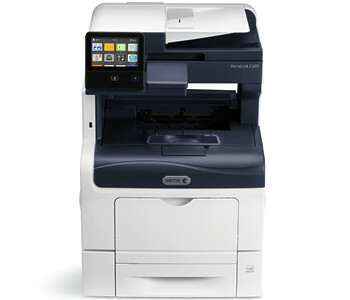 The smallest of Xerox’s B&W printers, the Phaser 3260 comes with standard duplexing, and built in wi-fi connectivity. Perfect for light duty as a personal printer for small/home offices. Download the Phaser 3620 Brochure for a full list of features and options.